Since it’s approaching the time that schools start a new year in the USA, it’s certainly a reminder to all of us to “get back” to what’s important in our lives. Although we might become even busier as we approach the fall season, we can make conscious choices now to create more passion and connection in our lives and relationships. With this in mind, here are 5 powerful ways to increase passion, love, and connection that have been sent in by readers like you. We invite you to try them out in your life! 2. “My boyfriend and I love to try to do not just ‘fun’ things together, but ‘childlike fun’ things together to refresh our relationship. Childhood is usually a unique time when a feeling of passionate play comes into enjoyable activities. “My boyfriend and I try to tap into that ‘passionate playful’ feeling by doing things we loved to do as kids, but do not usually think of doing as adults. “We feel a playful freedom going to Disney World together, (without any kids with us), and other theme parks, or water parks. We recently tried roller skating, and ice skating again after almost 20 years. 3. The best way I have found to show my husband I care is by taking packaged snacks and using puns from the names to tell him I care. Baby Ruth ” Baby, you are the best.” ; Planter’s nuts ” I’m nuts about you.” etc. It keeps things interesting, cheerful, and fun while he knows I am thinking about him. 5. “In my relationship, I think one of the keys to it is always make time for one another. Even if you only have 5 mins, let the other person know how much you care about them. “Always say I love you. Plus always keep open communication with your partner. Be a good listener and tell them what you are hearing from what they have to say. Make sure you both understand the same way. 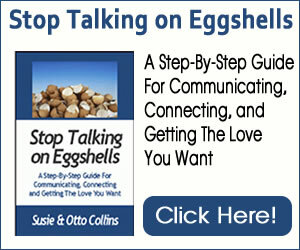 What great ideas for keeping love, passion and connection alive! We invite you to do just one thing this week to reconnect with each other and allow more of what you want in your life to happen.